In a recent article by Grim published in the Intercept, Crowley made the case to some Democratic Party loyalists about why he was “destined” to take on President Donald Trump, stating “I was born for this role.” Later, Crowley complained that his Democratic Party primary challenger, Alexandria Ocasio-Cortez, was trying to make the primary election “about race” and that she was being “unnecessarily divisive.” Crowley said that the party needed to be “fighting Republicans, and not other Democrats,” and, finally, “I can’t help that I was born white.” This bizarre talk given by Crowley shows that he is confused about what it means to take on Trump. As he desperately tries to paint himself as different from the President, the facts remain that they are both Queens men who inherited their dynasties (Trump financial, Crowley political), and who are beholden to Big Real Estate and Wall Street. Crowley was not born to take on Trump, he was groomed to be part of the élite. It’s not just that Crowley is scared of Bronx voters. Despite all his talk about standing up to Trump, the Congressman has taken many political positions that are geared specifically at upholding institutional racism. We are having a national conversation about how police officers are not being held criminally liable for crimes of brutality or homicide. In the face of no reform or accountability over policing, Crowley has supported legislation that provides police officers with hate crime protections, even though citizens have been offered no laws or protections from acts of brutality or homicide committed by police officers. Whereas the police have always been used to further racism in America, Crowley has chosen to ally himself with the police — the way war hawk Republicans do. In May, the Queens Democratic Party county committee endorsed ex-IDC member, Jose Peralta, in his reelection campaign for New York State Senate representing Corona, East Elmhurst, Elmhurst, Jackson Heights, and Woodside. This endorsement by the Queens machine can only be made possible with Crowley’s express support, and the endorsement flies in the face of the fact that Peralta’s membership in the IDC has kept the Republicans in power in the State Senate. While in power, the IDC and their Republican friends created conditions that blocked passage of the Dream Act and other progressive legislation. If Crowley was such a supporter of immigrants and the undocumented, why does he still maintain support for Peralta, who is a Republican enabler? Twitter user @OldNorthEnder posted images yesterday, showing that Crowley took huge amounts of campaign contributions from hedge funds profiting off Puerto Rico’s debt to the U.S. Government. By holding debt or creating new debt, these hedge funds have deprived Puerto Ricans of their financial security and have forced them into even greater dependence on the Government and financial institutions just to get by. The burden of repaying debt with interest adds more financial pressures, when disaster relief should be made as grants — not as loans. It is not that Crowley is simply just accepting Wall Street money, however. He is also actively encouraging austerity-like legislation that is so harsh that it is usually reserved for foreign countries, not U.S. Citizens. PROMESA (Puerto Rico Oversight, Management, and Economic Stability Act) creates a financial oversight committee that has been given authority to implement a brutal austerity regime on the people of Puerto Rico. This austerity regime includes the creation of “fiscal plan” that may lead to cuts in pensions for retirees and the restructuring — but not the elimination — of debt. If you remember what happened to the citizens of Greece and Italy, and were thankful that it wasn’t happening here, well think again. You could read Crowley’s hypocritical statement here about Puerto Rico. Although Crowley talks about a bright future for Puerto Rico, people on the ground understand a different reality. A very powerful natural disaster brought about by climate change is going to lead to austerity cuts and more pain and suffering — for Americans. For decades now, America has witnessed a relentless divestment from critical New Deal and other social safety net programs, most notably public housing. As Crowley prepared for his re-election race, he announced an Orwellian program called “A Better Deal” that would lead to the conversion of truly public housing programs to Section 8 programs. This move would open the door to the sale or lease of public assets. This is something that profit-chasing real estate developers and Wall Street real estate investors have long sought. In exchange for taking public assets, Crowley planned to offer tax credits to the rent-burned, an economical slap in the face to New York City tenants, nearly 60% of whom pay more than half of their wages in rent. New York has become unaffordable, and all Crowley can think of doing is taking public housing away from us and then offering menial tax credits in return. The Crowley Housing Doctrine of shutting down public housing and remaining silent in the face of tenants suffering through blatant rent-gouging has racial implications. 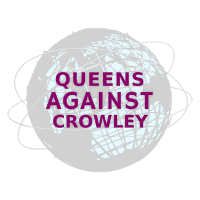 Because individuals with low incomes are disproportionately minorities, Crowley’s proposals and his campaign platform will lead to continued economic hardship for the minorities, who make up the majority of the tenants of the New York City Housing Authority (NYCHA). 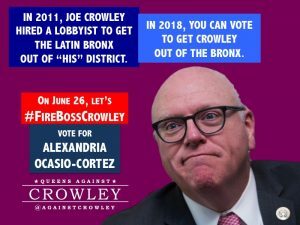 A favorite campaign talking point Crowley uses is that he is going to Washington to fight for New Yorkers. Well, when NYCHA tenants were asking for help with water leaks, outbreaks of mold, asbestos exposure risks, and lead poisoning — in the drinking water and in the house paint — where was Crowley ? It took a U.S. Attorney appointed by Trump, Geoffrey Berman, to bring about some reform and accountability at NYCHA. Throughout, all Crowley could do was propose to sell off NYCHA — instead of fixing it and expanding it. In 2002, Crowley voted to restructure the U.S. Department of Homeland Security (with its over-reach in powers), and this led to the establishment of Immigration and Customs Enforcement (ICE). For anti-immigrant, right-wing zealots, ICE has been described as a success story, because ICE has empowered the Federal Government to unnecessarily crackdown on undocumented immigrants, leading to raids in workplaces, separations from families, thwarted plans for college education, and deportations. 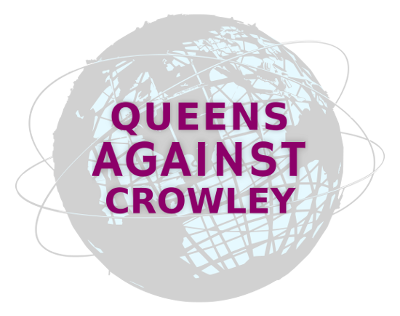 Never has Crowley been asked to account for his vote to establish ICE, despite its obvious racial consequences, particularly in Queens and in the Bronx. More locally, Crowley has never been asked to account for his unwavering support for the District Attorney in Queens, who resists criminal justice system reform and who tolerates the presence of ICE in the courthouses of Queens. Crowley is used to power being handed to him, and he has never once been faithful to the progressive ethos that people with more need to disperse excessive concentrations of wealth and power in order to fight exploitation and discrimination. Crowley went into politics, because his father was a long-time police officer before becoming a lawyer. His uncle, Walter, and a cousin, Elizabeth, were also politicians. Although Crowley likes to espouse his tales of descending from Irish immigrants, his American experience has been one of power and privilege. He was handed a seat in the U.S. House of Representatives by his predecessor in a political slight of hand that was denounced for its undemocratic move by the Editorial Board of the New York Times. Crowley inherited his post as boss of the Queens machine. Of the ten (10) consecutive, uninterrupted terms Crowley is seeking to serve in Congress, he has only faced political primaries twice. Power like his doesn’t like to be challenged. Politicians like to talk in nostalgic terms about the American dream, but what they really mean is the privilege reserved for people of certain heritages. Crowley’s history of supporting legislation that upholds systems of racial inequality shows that he really has no business representing Queens and the Bronx in Congress. When considered alongside the fact that he tried to kick Bronx voters out of his district — because of their race — its quite clear that Crowley is not a legitimate representative of some of the most diverse neighborhoods in the country. That is why, on June 26, we urge you to go out and vote for Alexandria Ocasio-Cortez. If elected, she will be one of the most progressive politicians in New York City and will be a much stronger advocate for the poor, working class, and immigrant families in the district she would represent.